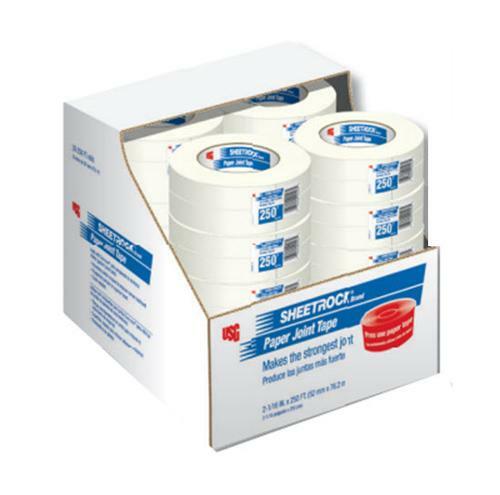 2 1/16 in x 500 ft USG Sheetrock Brand Paper Joint Tape at Cowtown Materials, Inc.
USG Sheetrock Brand Paper Joint Tape is a special fiber tape designed for use with USG joint compounds to reinforce joints and corners in gypsum drywall interiors. Also recommended for joint treatment in veneer finish systems subject to rapid drying conditions and where framing exceeds 16" (406 mm) spacing. USG Sheetrock Brand Paper Joint Tape resists cracking and stretching and is lightly sanded for increased bond. USG Sheetrock Brand Paper Joint Tape is manufactured from special cross-fibered tape with high tensile strength, both with and across the paper grain. Its high porosity produces a superior bond while eliminating the need for perforations. It also provides exceptional wet strength, resists stretching, wrinkling and other distortions, lies flat and resists tearing under tools. Easy to apply, the positive center creasing and uniform winding promote accurate and trouble-free application to angles as well as flat joints.